Bluecoats led a field of seven World Class corps Saturday, July 7, taking first place with a 78.65 during the DCI Kalamazoo event at Western Michigan University's Waldo Stadium. 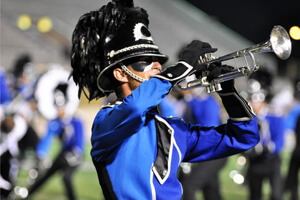 Now approximately a third of the way through their 2012 summer tour, Bluecoats drum major Haley Burks says that this season is turning out to be a strong one for the Canton, Ohio corps. "I think logistically we're a lot better than last year," Burks said. "So if everything works off the field, it's going to work on the field a lot better because there are less things to stress about. I feel like everything is just so much more smooth this year." Bluecoats drum major Dave Schaefer said he's enjoying the response the Bluecoats are getting from crowds this year, crediting it to the design of their 2012 field show, "UnMasqued." "Last year I expected a lot more from the crowd, but we never really ended up getting it," he said. "So this year I'm really happy with how they've been responding." Rounding out the top three on Saturday night were the Madison Scouts (2nd, 75.15) and Sprit of Atlanta (3rd, 74.15). With Spirit holding the Cavaliers (73.55) in fourth by six tenths of a point, the corps achieved a feat not accomplished since Aug. 10, 1986 in Sioux City, Iowa. Madison Scouts drum major Sean Hadley said his corps' 2012 production has been coming right along, with a couple more additions and changes in store for the near future. "We have a few over the last week that we've been implementing," he said. "And there are a few more on the way that we'll put in leading up to the Minneapolis regional next Saturday. 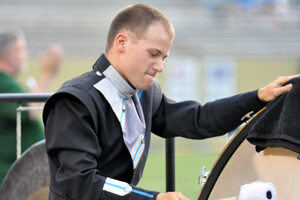 We're looking to really burst out of the gate there and show the drum corps activity that Madison is back in a big way." Drum major Denzel Brown said the Scouts have been pushing through the heat, with members giving it their all at rehearsals, getting better, performance after performance. "That just shows how much these guys are putting into rehearsals every single day, every single minute," Brown said. "It just feels like these guys are getting better every single time, and it's reflecting in the shows, in the scores and in the crowds' reactions." Just like the corps have experienced during previous performances, credit was given to a lively crowd in the stands at Waldo Stadium Saturday. "I think that having a really great crowd reaction in a really good stadium can put a lot of energy on the field," Hadley said. I think that was really beneficial for us. We've had a couple of shows in various places that it's been a little harder to get the crowd on its feet. But tonight's a different story. It was a pleasure to play for these fans." Blue Stars (5th, 71.40), Glassmen (6th, 69.50) and Pioneer (7th, 64.55) rounded out the World Class competition at Waldo Stadium. "Tonight's performance, and I know this is a little clich?©, was our best show so far," Glassmen drum major Wyatt Mullins said. "And I know everyone probably says that a lot. But I really, truly feel that we brought it tonight." 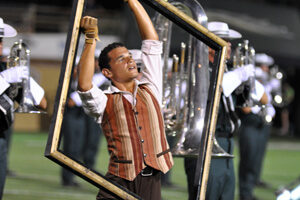 He said 2012's Glassmen, although having many veteran members, is a whole different drum corps with a new attitude.